Bida Nok is the outermost islet at the southern tip of the world-famous mini-archipelago known as Koh Phi Phi, or the Phi Phi Islands. Koh Phi Phi Don is where the ferries dock and tourists can find hotels, resorts, restaurants and nightlife. This is the main island is the shape of an uneven capital H. Due south is Koh Phi Phi Lei (pron. ‘Ko pee pee lay’), where the movie The Beach was filmed in 1998. And on Phi Phi Lei’s southern tip are two limestone islets jutting directly out of the sea. These are Koh Bida Nai and Koh Bida Nok. Diver at Bida Nok Photo by Ilse Reijs & Jan Noud HuttenBida Nok is the outermost piece of land in the chain of Phi Phi islands and this exposes it to thousands of square kilometres of open sea. 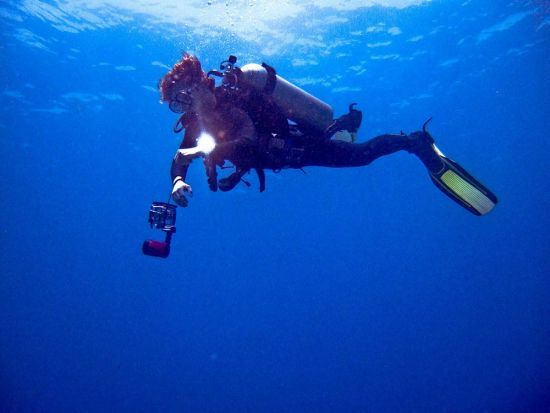 While this may sound like a recipe for difficult diving conditions, it is not at all. However, there is a great deal of interesting marine life here, both those who call Bida Nok home and those passing by. Although sightings of Whale Sharks (Rhincodon typus) and Manta Rays (Manta alfredi) are unlikely, they’re not unheard of. Several other cartilaginous fishes can be seen at Bida Nok, such as Thailand’s three most popular mid-sized sharks. Leopard Sharks (Stegostoma fasciatum) are seen on nearly every dive. They usually rest on the sandy bottom during the day, until divers get too close, then they slowly swim up and away, posing no threat to anyone and in no real hurry either. Blacktip Reef Shark (Carcharhinus melanopterus) are far more exciting, due to their shape and predatory behaviour, but they’re quite shy and only glimpsed here before disappearing into more open water. Finally, Whitetip Reef Sharks (Triaenodon obesus) are occasionally seen here, but not nearly as often as the aforementioned two species. There are also quite common sightings of stingrays, such as the Blue Spotted Stingray (Neotrygon khulii) on the sandy seabed. The dive site itself has something for everyone. Anyone from absolute beginners to diving professionals can enjoy their time underwater at Bida Nok. Those who have never dived before can jump in here and enjoy easy diving with a PADI instructor to a maximum depth of 12 metres. There’s plenty to see right up to the surface, and one or two sandy patches in shallow water to relax and practice simple skills. However, experienced and even professional divers can also enjoy an hour underwater at depths approaching 30 metres. Koh Lanta diving boats are a little larger than those local boats based on Koh Phi Phi. Liveaboards also visit here, as do boats from as far as Phuket. It’s most common for all divers to enter the water at the southern side of Bida Nok, where there is protection from waves and surface currents. From here, diving around the islet in a clockwise direction is best for experienced divers, as this allows them to descend to the site’s deepest part at the beginning of the dive. Of course, if currents and ‘dive traffic’ mean that one needs to go the opposite way, it’s not the end of the world. Less experienced divers and beginners will follow their guide, and for them it will make no difference which way they go. 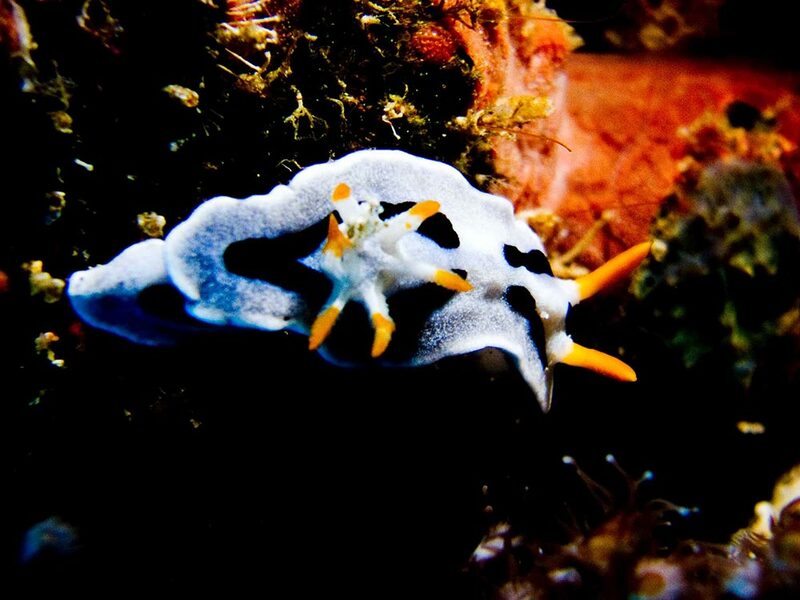 Nudibranch Photo by Ilse Reijs & Jan Noud HuttenIn addition to the aforementioned sharks and rays, there are plenty of other interesting species at Bida Nok, including reptiles, invertebrates and, of course, thousands of reef fish. Turtles and sea snakes are quite often seen, and neither is bothered by divers getting quite close. Invertebrates include nudibranchs, sea urchins, sea stars (starfish), and shellfish. Among the more interesting bony fish are Moray Eels, which take refuge in crevices during the days and force water past their gills. This looks like they’re acting aggressively, but they pose no real threat to divers, as long as fingers are kept away. The reef fish to be seen at Bida Nok are too numerous to mention all. Clownfish (Amphiprioninae) are cute and colourful. Triggerfish (Balistoides) swim around alone, and new divers should be warned of their behaviour during their nesting season. There are also plenty of schooling fish species at Bida Nok, some of which live here all of their lives and others which visit in the hope of a snack or sanctuary. Koh Lanta diving boats will normally visit Bida Nok as part of a two or three dive day trip. Koh Lanta Liveaboards also visit on almost every excursion, mainly because the dive site is so consistently good. It’s very rare that there is something extra special seen at Bida Nok, but it does happen. What makes this dive site so popular is that it’s reliable and always good. It’s easy for dive operators to keep everyone happy here, including those taking part in an Open Water course, those who have never dived before, and experienced scuba divers looking for thrills or macro marine life.